the Paris Blue Notes (vocals). New York, April 14, 1959. 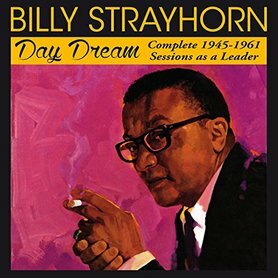 [1-3]: BILLY STRAYHORN (unaccompanied piano). Hollywood, fall 1947. Hollywood, late Summer or fall 1947. New York & Massachusetts, 1945-50. Live at Carnegie Hall, New York, November 13, 1948. Recently Billy Strayhorn has become a controversial figure, not something that the gentle genius would have sought. More than one writer has argued that Strayhorn has been under appreciated. One recent Ellington biography has hinted that Ellington did not give Strayhorn the recognition that he deserved. The fact that Strayhorn was gay in an era when his sexuality was barely acknowledged has also led to a reappraisal. The truth is that Strayhorn is an important part of the Ellington story and is a brilliant musician, composer, arranger, lyricist and pianist in his own right. The two CDs here present some complete albums: ‘The Peaceful Side’, ‘Cue For Saxophone’, ‘Great Times’ and parts of ‘The Jazz Scene’. In ‘The Peaceful Side’ we get many of the compositions in a small group setting that were composed by Strayhorn and featured by Ellington. All of them show the languor, sophistication and impressionism that is an essential part of Strayhorn’s art. ‘Lush Life’, written well before he joined Ellington, was featured rarely by the band but never recorded officially. It is a song that is astonishing in both its melody and lyrics because it was written by a very young man who was yearning for the lush life. ‘Take The A Train’ stands out because it is not dreamy; it immediately attracted Ellington and was played at every concert that the Ellington band gave. Strayhorn the pianist is featured on the album ‘Cue For Saxophone”. He is joined by Ellingtonians: Johnny Hodges, Shorty Baker, Quentin Jackson and Russell Procope. Al Hall plays bass and Oliver Jackson drums. This beautifully re-mastered album is saturated with superb relaxed playing from the bluesy Hodges and the master of trombone mutes, Quentin Jackson. There is not a weak moment amongst the ten tracks and it is full of jazz that will not perish as long as jazz is played. Ellington throughout his life deprecated his own ability as a pianist and so albums featuring his playing are not numerous. The one he recorded with Strayhorn is unique. ‘Great Times! Duke Ellington Billy Strayhorn Piano Duets’ is a great historical document as well as an intensely pleasurable one. The sessions were not well recorded and some of masters were damaged but in this version the sound is acceptable. In spite of his protestations, Ellington’s piano playing influenced Thelonious Monk, Stan Tracey and Cecil Taylor. The driving percussive nature of Ellington’s work is here matched by Strayhorn. Vitality and invention comes across from both men. Just listen to ‘Tonk’ and the way that they rip into ‘Cotton Tail’. At times this is almost like a cutting contest as they challenge each other. Exhilarating. ‘The Jazz Scene’ was produced by Norman Granz. Granz, probably the most important producer in the history of jazz, wanted to celebrate some of the most important artists in the music and he did record many of the most prominent musicians of the time. ‘Sono’ featured the sonorous Harry Carney accompanied by Strayhorn and strings. These two essential CDs with a comprehensive booklet collect important work and celebrate some aspects of Strayhorn’s achievements. His crowning achievements though are the compositions contributed to the repertoire of the Ellington band from 1939 until 1967.